It’s coming to the end of my three year training period at North Slope Farm. The years have passed in the blink of an eye but the amount of personal growth and knowledge I’ve experienced and gained will stick with me for a lifetime. Organic farming is a trade that is simultaneously coherent and chaotic, exhausting and rewarding, liberating and nerve wracking, but overall it’s just pretty darn fun. Few other jobs allow one to be outside enjoying the blue sky and bright sunshine; to make one’s own decisions about what needs to get done and when; or to see the final result (perhaps a shiny, colorful bunch of Swiss Chard) of hard work, all while helping the greater community and by practicing environmental sustainability. Training here over the years has begun to give me an understanding of how to balance the fun, the practical and chaotic nature of working and managing a farm. All potentially confusing tasks are broken down in to easily manageable elements: administration, infrastructure, compost, equipment, crop care, planting, greenhouse, marketing, harvesting and handling. And our years are structured such that we can get the most out of our experiences. My first year here was a whirlwind of information since trainees are made to engage with small tasks in all of these elements in order to be able to pick which one to focus on during the second and third years. The second year I had I focused on greenhouse duties. For the third year, I chose to focus on equipment, not as a manager, but because they were frightening during my second year, and I needed more practice with them. To allow me to get more aquatinted with the equipment, Mike often gave me the tasks of stale seed-bedding the Big Garden Beds, mowing and weed-whacking the sides of the BGBs, mowing the perimeter of the deer fences that surround our fields and then weed-whacking around the wooden fence posts, mowing the trails in “backyard” area and finally by occasionally assigning me to some light tractor work. The two tasks I’m going to focus on describing are stale seed-bedding and mowing the perimeters of the fences. These are repetitive tasks for almost the entire growing season. 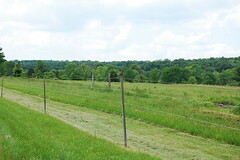 The next task was mowing the perimeter of the fence with the Kubota and scalping the posts with the weed-whacker. I’ve found that any sort of mowing with the Kubota, Billy Goat or weed-whacker is accompanied by a complex set of instructions due to hazard avoidance and removal, making sure the grass-blower is facing the right direction (grass clippings can damage crops, or mowing through a build-up of clippings can cause equipment damage), and general efficiency of movement. So, I’m not going into full detail about the riding patterns needed to complete the perimeters with the Kubota, but just note that getting lost is easy (especially in the “backyard” areas), double-mowing and getting stuck in the mud and running over branches is easy when attention is lost. Of course, there’s always a word of safety and caution before working with machines. Always know what safety measures are in place for the equipment that’s being used. It may be needed in an emergency or it may be engaged by previous user upon shutdown and maybe the reason for a machine not starting. Remember to check all fluid levels (gas level and fuel type, oil, hydraulic fluid, etc.) and to grease any joints that need it. Since each piece of equipment is unique, it’s best to check the corresponding manual (which means keep the manual) if something isn’t working, or turning on, or if you can’t remember what type of fuel or oil to use. Finally, always use headphones, protective eye-wear, heavy-duty pants and at the very least, sturdy shoes. Overall, the experience I’ve had with machinery this year has made me a lot more comfortable operating them.The mystique and fear have almost vanished, and now I just need to keep practicing in order to be able to work with them intuitively. General Observations: Last year, the month of September gave us a bountiful harvest while operations were working smoothly! Equipment 63 hrs: KG and RR received various equipment training. 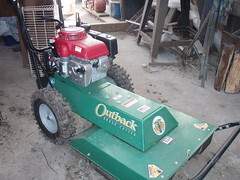 The Billy Goat walk-behind mower arrived. 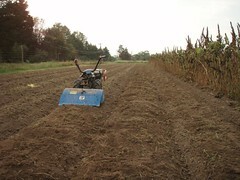 Fields were disk-harrowed for cover crop seeding. Veg. B mid was chiseled and rototilled. The Williams Tool Bar attached to the 265 was used successfully for crop cultivation. Administration 36.5 hrs: General administrative chores were attended to. Infrastructure 66 hrs: Baby chicks arrived early in the month. Their nursery was cleaned out, prepped and rat-proofed. The new Big Garden Beds were finished by forming them into a usable shape with the rototiller. Greenhouse 14.5 hrs: See Crop Care. Composting 3 hrs: Compost went to the corner garden and the new Big Garden Beds. Planting 57.5 hrs: Cover crops were seeded onto certain fields. Some cover crop seed required inoculation and the crew received training on how to use the innoculant. By mid month, there was a push to get beds seeded for the new moon. 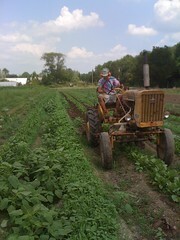 The central field was seeded with kale, radishes, arugula, salad and tatsoi. This was an unusual practice. With the exception of kale, the other crops are usually seeded in our raised garden beds, not a field bed, and they were watered for 6 hours instead of 4. 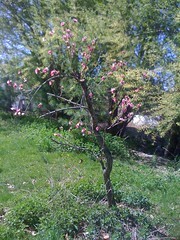 But they grew well, as shown in the photo above. At the end of the month, the new Big Garden Beds were seeded for the first time with salad mix. Also, the corner garden was planted with Bee Balm, Mountain Mint, Sweet William and Lovage. CropCare 158 hrs: One notable message, written after a 5hr afternoon in the tomato greenhouse, stressed the importance of keeping up with pruning and trellising. But many hours went into crop care. Beds were mulched with hay, others were weeded by hand or with scuffle hoe, flower beds were staked and strung, and one greenhouse was completely cleared out, just to name a few activities. Harvesting 372.5 hrs: There was plenty to harvest in September 2012. Our vegetables included: kale, chard, fennel, beans, beets, carrots, salad mix and squash. Hay was harvested (it was noted that the 579 field was cut 3 times last year), tomatoes got picked several times a week and CH’s corner garden provided a lot of lemon verbena. Handling 97 hrs: Tomatoes take a long time to sort. In addition to market sale records, lots of product-value calculations were written in the log this month. Our ketchup and tomato sauce had arrived from processing: 600 pounds of our tomatoes yielded 104 quarts of sauce at a cost of $361.00. If tomatoes are $1/lb, and worker pay at $15/hr with 12 hrs of work, and the cost of processing is $361.00, then total cost of labor is $1141. Divide by 104 quarts and the minimum value is around $11/quart. Ketchup bottles had a similar calculation which put them valued at $8-9/pint. There were also calculations for flower bunches and salad mix values where the worker pay was raised to $30/hr. Flower bunches were found to be valued around $12/bunch and salad mix was valued at $10/lb. Special Projects 2.5 hrs: Hay bales were collected for a winter project of building a hay bale dwelling. KG experimented with micro-green production and switched from a three week seed to harvest time, to two weeks. Wk 1: Overcast and rainy. Arrival of Hurricane Issac. Wk3: Sunny, clear and cool. General Observations: Life on the farm is on-going and it’s nice to look back and find that activities are much the same this year as with last. Last June, the grass needed to be mowed or whacked regularly, hay fields needed to be cut and baled. With three weekly last year, we spent most of our hours harvesting and caring for existing crops and planting more. Equipment 44 hrs: On the first of June, new beds were ripped in Veg. C South using the IH140. It took .75hrs for a single rip of 16 beds. Later in the month, the Kubota mower had a broken belt that was fixed, the new 265 wouldn’t start, so the beds that needed to be roto-tilled were done with the BCS instead, and the hay baler broke which involved an intense fixing process. Administration 27 hrs:A rainy day on the 12th provided the crew with a pie break and a discussion of future plans. Meanwhile, CH began working on the organic certification forms which were copied and filed away when complete. RCM worked on the June summary for 2011, and the website got an update featuring new crop availability and invitations to the Solstice party. Infrastructure 52.5 hrs:The first major hay cutting occurred on 5/31 and took approximately 5 hours to complete the Mulch field SE, Veg D and 579 field N. Then on the 10th and 11th respectively, the cut hay was raked in Veg D and MSE, then it baled in Veg D until the “bushing shredded on plunge center.” In the market garden, there was a second cutting of hay from a cover cropped field on the 16th. Mowing and weed-whacking of various areas around the farm happened every week this month. There was an on-going fox watch from May, and one day while stringing tomatoes KG spotted it in the chicken fields and the crew promptly cut off our strings and chased it out. KG and TH went on a reconnaissance mission and found the fox’s hole and (if my memory serves correctly) set a trap. One chicken was injured due to a laceration and put into a recovery home. Greenhouse 16.5 hrs: Ralph’s house was cleared and prepped for tomatoes. Sungold, Brandywine, and Corsalo were all transplanted in. There was a general seedling clean up, and the 4th succession of veggies, 2nd succession of flowers, and another succession of tomatoes were seeded. Composting 6 hrs: After ripping the beds in Veg C South on the 1st, 8 of them were composted with 1.75cyrds ea. Totaling 2.35 hrs. The other 8 beds in Veg C S were composted later with the same amount. A couple big garden beds were composted this month as well. 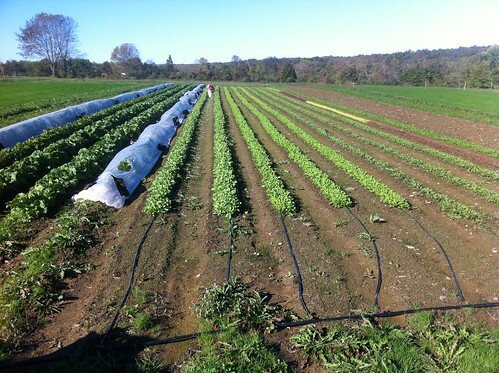 Planting 125 hrs: BGBs were prepped and direct seeded with salad. Beets, fennel, basil and the rest of the 3rd veggie succession got planted in Veg C S. Flowers were planted in the 579 field, though they were planted late. Other BGBs were prepped and seeded with turnips, carrots and transplants of scallions. 7 beds of Veg C S were direct seeded with beets, beans, squash and radishes. Veg C North received primary tillage with the chisel plow and was then roto-tilled. 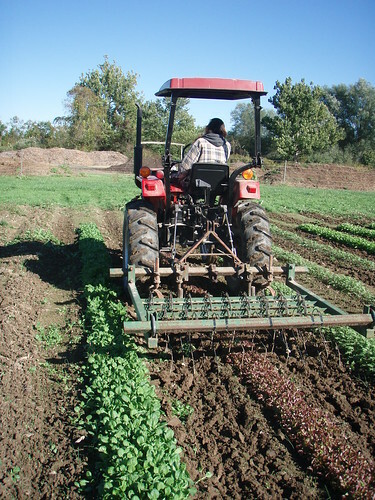 Crop Care 215 hrs: Lots of time weeding, sometimes the soil was too wet and the weeds need to be cut instead of pulled to avoid pulling out clumps of mud. There was also a lot of trellising and stringing for the flowers and tomatoes, and cleaning out irrigation lines and other debris from Veg B. The Williams tool bar was used on the 265 to cultivate small beets, chard and kale. One major issue regarding the field tomatoes was that their trench was dug too deep and it wouldn’t drain so they got flooded with water. Harvesting 249.5 hrs: 6/1- Salad mix 96.5lbs, 6/2- Strawberries, scapes, and various herbs. 6/6- salad, tatsoi, peas, chard, turnips, strawberries, beets. 6/7- Kale, chard, beets, tatsoi, peas, scapes. 6/8- Salad mix 67lbs, cut flowers. 6/12- Cut flowers. 6/13- Beets, kale, chard, salad mix, tatsoi, strawberries. 6/14- Kale, chard, radishes. 6/20- Salad mix, chard, kale, beets, turnips, carrots, flowers, hay. 6/21- Hardy greens, turnips, carrots, hay. 6/22- Salad mix 90lbs. 6/28- Hardy greens, carrots. 6/29- Salad 79.5lbs. Handling 76.5 hrs: KG and RR handled/washed produce a lot this month. My second year was spent focusing on greenhouse production. I found that it took a lot of time to manage and that I needing more training in other elements of the operation. So, this year, instead of focusing on one particular element, I want to be open to accomplishing tasks in as many elements as possible. To me, this means to be aware of what jobs there are to do (that no one else is assigned to) and to prioritize those jobs and finish them in a timely manner. It also means that I’ll need to work with others so they may accomplish their tasks. That being said, I do want to find jobs with in the elements that challenge me to operate machinery such as tractors, trucks, mowers, weed-whackers, tillers, and power tools. These are the things that have frightened me in the past and I desperately need to gain experience with them. My hope is that by the end of the year I would have the ability to continue working on these skills for a future job or training program. To be open and aware of different tasks around the farm, particularly those that I find challenging, and to do my best to complete the task. Last March we recorded long periods of warm and dry weather during the first few weeks. At night, temperatures sometimes dropped below freezing, especially toward the end of the month. The warmer weather made more outdoor work possible, and crop care was in full swing. But indoor work and training also needed to be done as the season began. The office was tidied up, website worked on and apple trees were ordered. With the full crew around, MR gives an introduction to the farm by explaining the elements task list, and discussing the specifics of the crop plan and crop rotation. The March 2011 summary was posted on the website. Seed orders and supply orders were made. The Quick Books Payroll was set up. Road trip to buy supplies! 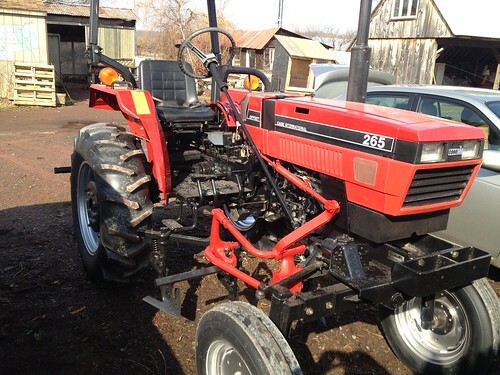 They came back with a new tractor (named: Big Red), irrigation supplies and a new mulch spreader. RCM cleaned out and organized the walk in cooler. Everyone got training on the farm’s water system. Mowing occurred. The fence was repaired. Second year interns got tractor training including a review of engine systems, safety and operating procedures, and drove them for the first time. Always needs to be sifted for greenhouse potting mix. Hopewell Market was every Wednesday. There was one run to Solebury orchards for apple sauce and juice for Hopewell Market. Remay over strawberry beds. Weeded asparagus beds. Weeded and mulched strawberry beds. Pear trees were thickly mulched. Water to fruit trees. Greenhouses were weeded. Weeded strawberries again. Garlic beginning to be freed from crab grass. Big Garden Beds were cleared of plastic and hoops. Blackberries were securely trellised. Garlic still being freed of crab grass. Pruned older apple trees. Garlic was easier to free after a pass from a tractor. Seed orders for seedling sales were made. Inventory of supply. Salad tables were slowly cleared out to allow for an extended salad harvest. Aphids noticed on floor weeds, those plants were removed. Hazelnut, Almond and Walnut and Apple tress were planted. KG proposed a slightly modified crop that factored in beans and leeks. Peas were planted and radishes and turnips were direct seeded in Ralph’s house. New interns got training on harvesting kale. Table top lettuce and spinach was harvested for wholesale accounts. Week 2: Clear, windy, mild temperatures, feels like spring, but freezing at night still. Week 4: Warm, sunny, windy, with freezing nights at the end of the month.